The city of Vushtrri will now have its youth center, an investment of MCYS worth 280 thousand Euros. 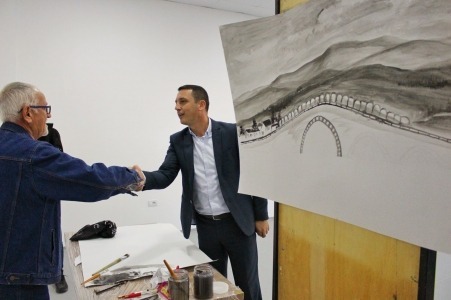 Minister of Culture, Youth and Sports, Kujtim Gashi took part in the inauguration ceremony of the facility. Minister Gashi said that this ministry's investment is one of the most important investments as it is done for the Vushtrria’s youth with its outskirts, considering it as a hotbed and institution of youth that will be used to carry out numerous activities and for innovation. "We as Ministry have invested 280,000 Euros for this facility, which is also one of the most important investments within the Department of Youth, and our young people with many ideas, creativity and engagement are keeping the spirit of youth alive in Kosovo and especially in Vushtrri ", said among other things Minister Gashi emphasizing that this will not be the only MCYS’s investment MCYS in Vushtrri. "This building is a space that will be used by the Vushtrria’s youth and we know they have the capacity for creativity and innovation", the minister pointed out. Minister Gashi during his speech at the ceremony also spoke about the Ministry's plan to create a special fund for young people in order to assist them in realizing the projects they have. "For the first time in 2019, we will start a major youth program called the Youth Fund, the cost will be high, and it is intended to support all, young people, and especially young entrepreneurs”, said the minister. While the Mayor of Vushtrri, Xhafer Tahiri, said that this facility will be the home of the Vushtrri’s youth. "This is the home of the youth of Vushtrri. It will be a building that will serve all citizens. From now on, Vushtrri's youth have their own home, they have their own address".